Coworking might once have been considered a Millennial or business start-up ‘thing’, but in 2019, it is transforming office space leasing. With an estimated 1.7 million people already coworking and growth at 20% per year in global cities, this is a force to be reckoned with 1. Evoke Projects looks at the coworking movement and what it means for office fit-outs and refurbishments. Once upon a time, coworking was the domain of small start-up business owners who didn’t want to work at home. They leased space in a business centre where they benefitted from a short-term lease, shared services such as printing and reception staff, and no office fit-out or refurbishment costs. Coworking evolved into working communities, where the office design layout encourages collaboration and skill-sharing. Today, you will also find office and retail coworking spaces, bringing valuable customers to retailers while providing convenient coffee, food and fashion to office workers. Liz Elam, a highly-respected authority on coworking, defines coworking principles as community, openness, collaboration, accessibility and sustainability.2 While the coworking industry often debates the differences between serviced offices, business centres and ‘proper’ innovative collaborative spaces, we see flexible working at the heart of all these office design models. The office fit-out should support independent and flexible work amongst people with shared values in a community setting. What is leading the move to coworking? Millennials are attracted by flexibility, creativity and empowerment. A traditional 9-5 office environment is unappealing and does not bring out the best in them. Regardless of employee age, the benefits of an office design that facilitates coworking are being universally recognised. It helps attract the best workers and improves retention and engagement. People can choose when and how they work. The lines between home and work are being blurred in a good way because people can be their authentic selves and bring their top game to the office. From a financial point of view, coworking gives companies flexibility as they do not have fixed overheads, and the leases tend to be shorter than traditional commercial leases. Indeed, a sense of community helps people to thrive at work, not only in motivation, but also through an improved sense of well-being and mental health. The WELL Building Standard® v2, which promotes health and well-being through building and office design, includes ‘Community’ as one of its core office design principles. How is coworking affecting office fit-outs and office refurbishments? There are now entire websites dedicated to finding coworking spaces. Recognising the growth potential, large players in the real estate industry are creating and selling their own coworking brands. Coworking is also changing the whole business model for commercial office space landlords. 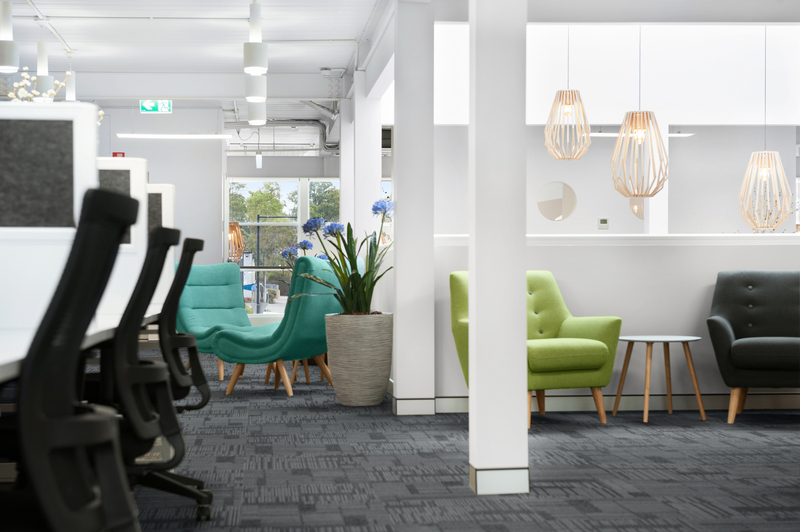 Rather than leasing basic square metre space and leaving the office fit-out to tenants, landlords are working with office fit-out companies to design attractive and marketable coworking spaces. Barangaroo in Sydney, NSW, is a world-class example of a purpose-built coworking precinct, with corporates, small businesses, retailers and restaurant owners all benefitting from the symbiotic relationship. It is very much its own community. At Evoke Projects, we specialise in collaborative office designs to enhance employee well-being, motivation and productivity. Please call us on 1300 720 692 to find out more about office fit-outs for coworking and flexible work spaces.